In the late &apos;80s, Bill Cosby had things on lock. So much so that NBC granted him a spin-off for a television show starring his fictional daughter Denise Huxtable (Lisa Bonet) as she made the transition to college. Denise only lasted a year, but the true break-out character was our dude with the flip-up glasses, Dwayne Wayne. Quickly becoming a pop culture icon for his style, people started checking out Dwayne’s feet as well — rocking heat on a regular basis. We can only assume that Cosby’s sweater budget for wardrobe was absorbed by the homies at Hillman for kicks. With the show jumping off in ’87 and lasting until ’93 and a handful of reccurring male roles, we ended up finding a lot of classic kicks that made their way on the show. 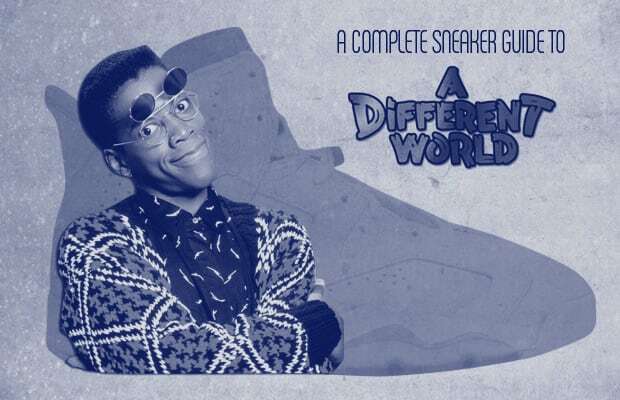 141 episodes, 71 hours, 100 Diet Cokes, and 46 shoes later we present A Complete Sneaker Guide To &apos;A Different World&apos;. Enjoy.